I wrote the below text shortly before word began to spread about the attacks in Paris. I was about to put my computer away when notifications started popping up on my phone. My first thought: "Please, not again." The next hour was spent compulsively scrolling through feeds, but at a certain point I decided to disconnect. I deleted Facebook and Twitter and kept the news off the TV. Periodically, I'd look at the New York Times for updates, all of them devastating. That evening, I just wanted to be with Eric. We hadn't seen each other in a few days since I was down in New Jersey visiting my family earlier in the week, and so we curled up on the couch, had dinner and put on some mindless shows. While he did the dishes, I went over to Maki's bed and lay beside her and she gave me a few licks with her tongue. She knew what I needed. I'm not the DIY type. As a blogger, I feel like I'm in the minority. I've seen the posts featuring cool labels and homemade this and that, stared at them admiringly, Pinned them and thought, "That's so beautiful! I should make those for our next party." But then, when I'm cooking for 20+ people, I quickly forget about all of that and focus on just getting the meal on the table. If there's anyone who could get me into DIY, it would be Maggie. I've known her for years, not just through her site, Eat Boutique, but on a personal level... she lives a few towns over from us and we try to get together about once a month. Maggie is an inspiration, not just because she's created a wonderful, hugely successful brand, but because she's a lovely person with a beautiful heart. 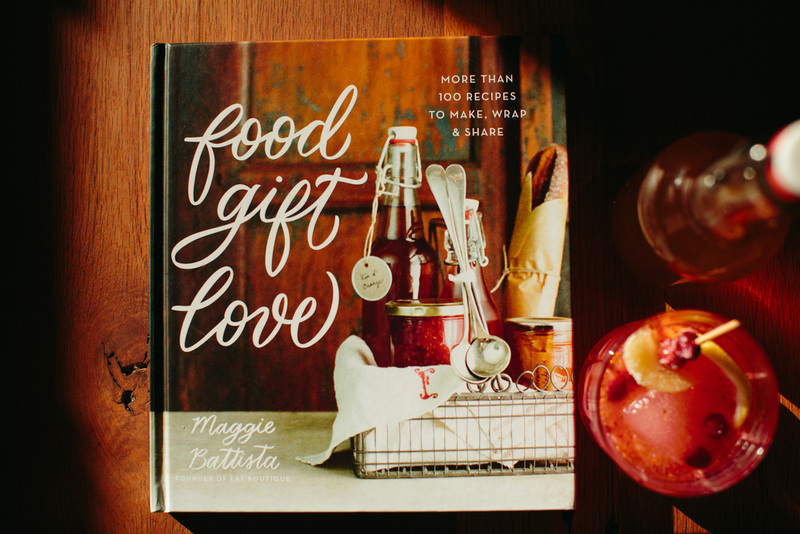 When she first told me about her book, Food Gift Love, I was absolutely ecstatic. I know it was a tremendous amount of work... but the result is pure magic. It's a fabulous resource for recipes to make for family and friends (or, you know, to just treat yo self). Eric and I have been playing around with homemade liqueurs. We picked up a handle of grain alcohol when we were in New Jersey a few years ago with the mission of making limoncello (at the time, grain alcohol wasn't sold in Massachusetts). The bottle sat in our cabinet for years, untouched. This past summer, I decided to try my hand at some homemade ginger liqueur. If we could, we'd put ginger in every cocktail, so it made sense to make our own. We pulled out our handy dandy sous vide and used that to speed up the process (this allows you to heat the liquid to a temperature where you won't burn off the alcohol). So, here we are... a recipe for homemade ginger liqueur, a twist on the whiskey smash (perfect for all your holiday parties), AND a giveaway of Food Gift Love. Could it get any better? I don't think so! To enter: Leave a comment on this post. 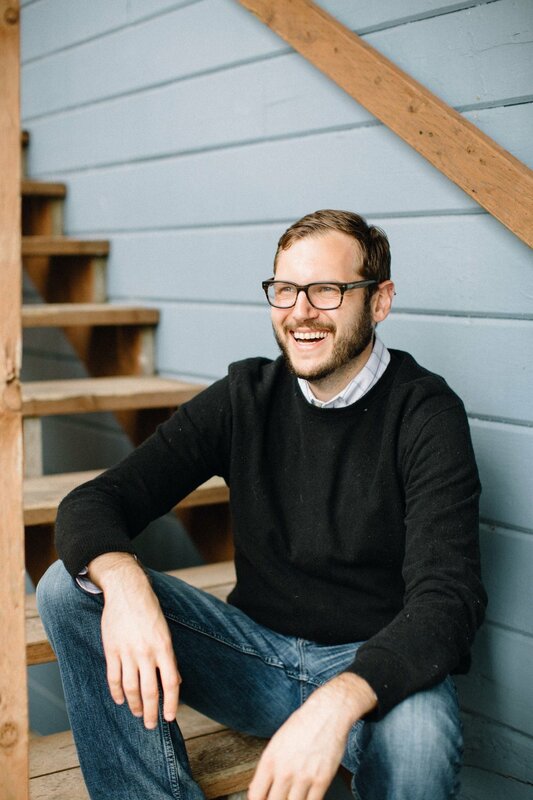 It can be anything, but I’d love to hear what you're all doing to celebrate the holidays. Rules: This giveaway will end on Friday, November 27, 2015 at 12:00 PM EST. I’ll pick one (1) winner via random.org and that person will be contacted via e-mail. One (1) entry per person and entrants must have a US mailing address (sorry international friends) and provide a valid email address. Best of luck! 1. 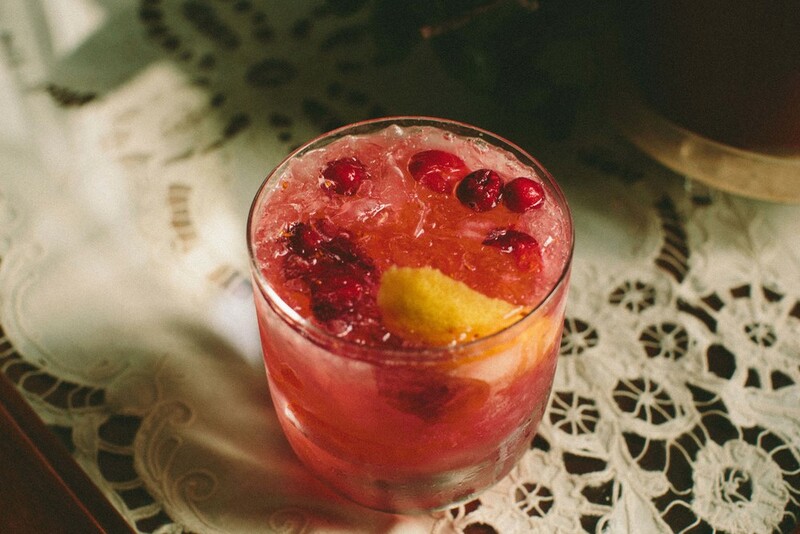 In a cocktail shaker, muddle the cranberries and ginger liqueur. Add the whiskey and lemon juice, cover shaker and give it a couple dry shakes (no ice). 2. 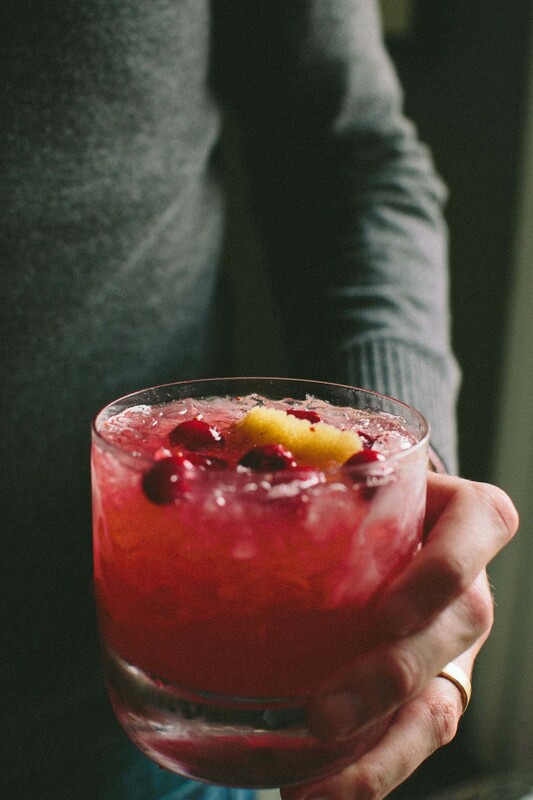 Pour drink and muddled cranberries into a rocks glass filled with crushed ice. For serving: garnish with a lemon peel or with candied ginger and sugared cranberries. 1. Add the sugar and water to a pot and set over medium heat. Whisk until the sugar has dissolved into the water. Add ginger and orange zest and bring mixture to a boil. Once it reaches a boil, reduce heat and simmer for 20 minutes. After this, let the syrup cool to room temperature. 2. Transfer the liquid and all ginger pieces and orange zest to a large sealable jar with vodka or Everclear. Close tightly with a lid and give the mixture a good shake. 3. After 3 days, strain mixture through a fine mesh sieve to get all ginger and orange peel out.